I am a firm believer in tea breaks and was inspired last night by The Hairy Bikers, of all people, to make these lemon and cardamom cookies. They are really easy. Preheat oven to 190C/375F/Gas5. Line a large baking tray with baking paper. Beat the butter, sugar and lemon zest together in a large bowl until pale and fluffy. Beat in the flour, almonds and cardamom until the mixture is well combined and comes together to form a stiff dough. Split the dough into 12 equal pieces, roll into balls and place on baking tray. Press each cookie down with the bottom of a glass to flatten – you can make patterns if you are artistic (unlike me). Bake for 12-14 minutes until pale golden brown. Leave to cool then transfer to a wire rack. They will crisp up as they cool. The recipe does go on to say store the cookies in an airtight tin and eat within 7 days – not a problem in this house!!!!!!!! 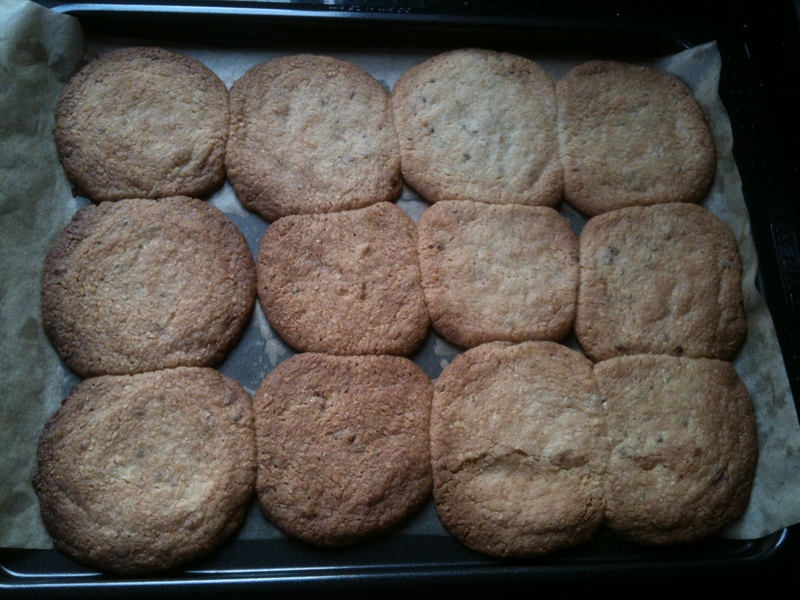 Lemon and cardamom cookies - might need to use a larger tray next time!